The dividend income our family earns this year (2017) … will set a new record. We are currently on pace to earn over ,500 in dividend income this year, which is over a $100 more than we previously projected. And next year (2018), we feel that $3,000+ in dividend income is certainly a possibility. So in order to hit that mark, we set a goal to build our forward dividend income to reach $3K. In order to earn $3,000 in dividends next year … we will rely on 3 different paths to get us there. The first path for growing dividend income will come from company dividend increases. Currently stocks in our portfolio gives us an average raise of 6.17% a year. That is about $150 extra income annually just for doing nothing! Pretty cool. The second path for growing dividends next year will come from dividend reinvestment. So taking the $2,500 we will earn this year and reinvesting it in stocks that average a 3% yield will earn us another $75+ of income. Finally, the biggest path for growing our dividends in 2018 will come from new investments. For example, if we were to invest $10,000 in new money next year … that would generate $300 of income with an average yield of 3.0%. Combining all those sources (dividend increases, reinvestment’s, and new investments) should create at least $500 of dividend income increases next year. Adding that to our $2,500 we will earn this year brings us close to $3,000 of income. So in order to reach this goal, we are focused on investing a good portion of our income each month. Here is a recap of our November results of growing our dividend income. We had a goal (set back in October/November 2016) to grow our forward annual dividend income to $3,000 by the end of 2017. So in 14 months, we needed to increase our future dividend income estimates by approximately $900. That may not seem like a lot, but it takes a lot of capital to reach this goal. Instead of tracking our savings each month, we will track the investments we are making. I don’t usually like to let our savings sit idle and would rather our dollars be working for us to generate more income. Lately, we have been cutting back a bunch on our new taxable investments and instead focusing more on building up tax deferred accounts like a 457 plan we just opened up. Tracking our investments will give a snapshot of how close we are to raising future annual dividend income to $3,000 by the end of 2017. At this point … we are not going to hit our goal … or really come close. But that is okay as we still invested a bunch of our savings over the past 13 months. During November, we invested new money into 5 different stocks. Note – All stocks bought in November did not have any commissions or fee’s charged as we used our zero cost broker and third party transfer agents – Robinhood, Amstock, and Computershare. The following list shows stocks we purchased in November and the amount of future dividend income it will produce. In total, we invested money into 5 different stocks. We continued our automated investments ($50 each) in Exxon Mobil (XOM) and Cincinnati Financial (CINF). We will probably stop both of these automated investments soon after the end of the year. Recently, we have been adding money to a couple new stocks in our Robinhood account – Hormel (HRL) and Kroger (KR). We got awesome news last week about a double digit raise from Hormel … which makes us want to add a lot more shares when we have the funds available. Finally, we couldn’t help but add a couple more shares of Omega Healthcare (OHI) as the stock has really been beaten down. I probably should have resisted the urge … but in the end the yield is just too rich to pass up. Note – We did not sell any stock during November. After calculating our new purchases, we invested $333.53 in new money in November. This has increased our net forward annual dividend income by $14.56. The yield on cost for these new investments is 4.36%. During November, we invested ($1,096.47) less than our monthly goal ($333.53 – $1,430.00). When we set our original goal back in November (2016), our estimated annual dividend income was $2,100. So … we needed to increase this amount by $900. At the start of November, our estimated annual dividend income was $2,787.75. The goal by the end of 2017 was to push this number up to $3,000. Our updated annual dividend income estimates at of the end of November rose to $2,808.91. That is a $21.16 increase since last reporting. Most of the increase was a result of the new investments we made in November and dividends that were reinvested. The other portion of the increase came from company dividend increases and dividend reinvestment. That is the awesome power of dividend investing! 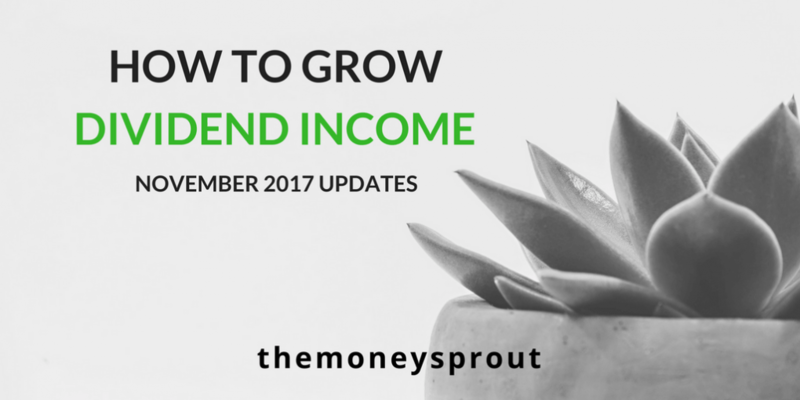 As I mentioned earlier, we are not going to reach the goal of increasing our future dividend income to $3,000 by the end of 2017. Instead of investing $20,000 in 14 months, we will invest just over $15,000. That is still a pretty good chunk of money working for us in the market. Based on our new estimates, our 12 month forward dividend income should reach around $2,830 … which is still pretty strong. Why did we miss our target by so much? The biggest reason is that we have been focusing more on building up our tax deferred accounts the past 3 or 4 months. I think it is important to have a good balance of taxable and tax deferred investments. We plan to start publishing information on our tax deferred dividend income at the start of 2018. In the meantime, we plan to finish out 2017 with a record amount of dividend income earned for our portfolio … which should be very close to $2,600!